How to remove forgotten password from Outlook PST file? If you do not remember the password to your PST file, you lose access to mail messages in the file. In such situations, it is necessary to remove / unlock PST password. Many years ago, Microsoft released a free utility called pst19upg.exe which was originally designed to upgrade the PST format to version 19. One of the side effects is that it can strip out PST password. In this tutorial we’ll walk you the steps of removing PST file password using the freeware pst19upg.exe. How to Remove PST File Password with Freeware pst19upg? Download these two utilities pst19upg.zip and scanpst.zip, save them to your local folder C:\backup and unzip. pst19upg.exe is the built-in tool available in Outlook 2003 or even older version, while you can access scanpst.exe from any Outlook version. Run the scanpst.exe tool. Click Browse to select your PST file and click Start. After the scan is complete, a dialog reports the errors found. 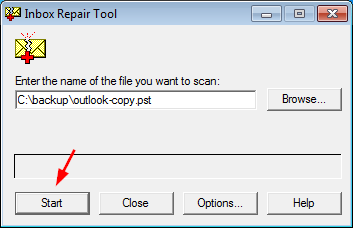 Click on Repair button to repair the PST file. 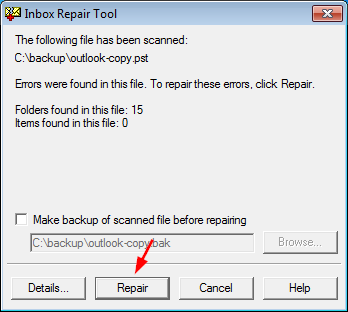 When it’s done, the scanpst.exe utility will show a “Repair complete” message. Click OK.
Now open the Command Prompt by pressing Windows + R key combination and typing cmd. Type the following command and press Enter. This will convert your pst file to .psx format. When complete, type the following command and press Enter. This will create a password-free pst file from the psx file. Now you’ve successfully removed the PST password. Run the scanpst.exe file to repair the newly-created pst file. After that, copy this PST file to the original location and you can then open Outlook application without prompting you to enter PST password. This pst19upg.exe tool will work only on MS Outlook 2003 and earlier versions and it can process ANSI formatted PST files only. If you need to remove the password of Unicode PST file, you have to use the third party software – Outlook Password Recovery, which supports all the Outlook versions. In all versions of Microsoft Outlook, password protection is commonly used to protect the content of our PST files. If your PST files are password protected, then no one (any unknown or unauthorized person) can open or access your data, including messages, contacts, calendar, tasks, notes, etc. If you have password protected a Personal Folders file (.pst), a dialog box similar to the following appears when you try to open the .pst file in Microsoft Outlook. But have you ever imagined what would happen if you lose or forgot the PST passwords? All you important information inside the PST file will become inaccessible. However, such issue can be easily handled provided you have a professional PST file recovery application. In this tutorial we’ll explain how to recover Outlook PST file password using the Outlook Password Recovery program. How to Open Password Protected Outlook PST File? After installing, launch the program and click on the “Unlock PST File” button from the main interface. It will prompt you to choose a password-protected Outlook .pst file. After selecting your .pst file, click OK. The program will display some passwords which could be used to open your password protected Outlook .pst file. Microsoft’s encryption is so weak that there are multiple passwords that can open a single encrypted PST file. The passwords that the program returns will work and they may not even include the password you had provided upon creation! I am facing very critical problem. I forgot my Outlook .pst password. My important emails are in the it. How can I break this password? Please guide me! It’s very urgent for me. Thanks in advance. Most people know that Outlook stores your Outlook data (e-mail messages, calendars, contacts, tasks, and notes, and more) in a PST file. To prevent any unauthorized access to your personal and confidential information in Outlook, you can protect your PST file with a password. But things goes wrong when you set strong password for your PST file but forgot the password later, how to break Outlook .PST file password? Luckily there is a powerful Outlook password breaker software that can help you break PST password easily – Outlook Password Recovery, which allows you to break Outlook PST password in Microsoft Outlook 2010, 2007, 2003, XP, 2000, 97. Just locate your PST file and you can recover your forgotten password in just a single mouse click! How to Break Outlook .PST Password? Launch the program and then click on the Unlock PST File button. 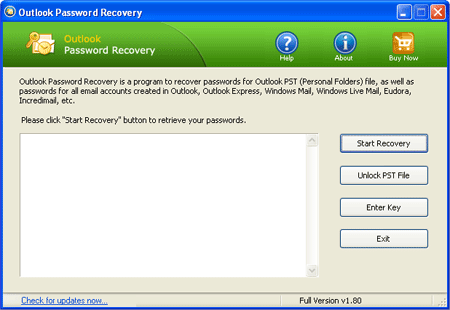 Your Outlook PST password will be recovered immediately. Outlook Password Recovery program is capable to break password of any length and complexity and also recover multilingual password. 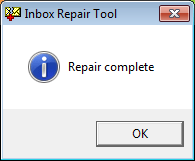 It supports all versions of MS Outlook. So, if you lost or forgotten your PST file password, download this Outlook password breaker tool to recover lost password in fraction of seconds.